Didn't see any posts on here about this, and I thought it was interesting and also a little sad. A fan was able to approach Billy Zane, voice of Ansem in KH1, and ask him about the character. Not only did he remember Ansem, but was apparently fond enough of the character to do a decent sketch of him and sign it. Most interestingly, we learn that he didn't turn down the role in future titles, nor was he offered it at all. This may have been a budget move after all, with Zane being a more expensive voice than Epcar, and Ansem's role in KH2 being much smaller than in KH1. Zane's drawing can be seen below. Man, that is simultaneously super-cool and super-sad. Super-cool because he remembered the character clearly enough to draw it from memory, which would mean he must've enjoyed portraying the character a considerable amount. And super-sad because knowing this makes it hurt that little bit more that he didn't/hasn't been asked to come back since. If we hadn't heard Richard Epcar voice Seeker of Darkness in the Kingdom Hearts III trailers already, it still would've been possible for him to return; it wouldn't have been the first time they've changed the voice actors back and forth between games. One example being Ansem the Wise, who was voiced by Corey Burton in Re:CoM and then had Christopher Lee reprise the role again in Days. And of course Kairi and Xion have had their voice actors swap back and forth between games. Naturally we're talking about a much bigger time gap as opposed to my examples, but all the same. Also, for an impromptu sketch at a booth of a character he voiced back in 2002, he drew Ansem surprisingly well! Zane was blacklisted by time KH2 was in production, wasnâ€™t he? There was no way Disney was going to hire him back, sadly. I didn't know Billy Zane was blacklisted at any point in time, but I was likely a simple-minded stoopid boy at the time, so I wouldn't have been interested unless it directly involved a small list of specific things. Why was he blacklisted? Would he still be blacklisted now? I have never found any hard evidence on this and wouldn't be surprised if it was a very popular rumor. At the time of this film, as a country America was only just starting to get on board with the anti-war sentiments following our invasion of Iraq and the Middle East. Even so, people werenâ€™t 100% there yet and even then America sees itself as the â€œgood guysâ€ most of the time. This film depicted America as ruthless bad guys. Ehile the public wasnâ€™t too aware of this film, it spread about in political and military circles. It was also upsetting our allied countries who were still pro-Iraq War. The controversy surrounding this film spread enough through Hollywoodâ€™s inner circle that Billy Zane was essentially blacklisted from work beyond small time roles due to being in the film. If true, that is pretty sad. I had always assumed that Zane just didn't want to commit long-term to the series or something and had only done KH1 as a one-off. Disney did a disservice not to bring him back, whatever their reasons. It's a shame. I remember being scolded when I first joined, told that his absence wasn't because of any blacklisting. Ah, memories. Even if this is the case, it's sad we'll never see anything concrete that tells us why he was absent. [...] Ansem's role in KH2 being much smaller than in KH1. I mean, he didn't really have a large part in the first game either, so it couldn't really have been that much more studio time. The combination of the (minimal amount of) dialogue he was given and his delivery was just enormously impactful, and his rich vocals were a welcome contrast to the rest of the cast. There were also a lot more characters in KHII in general, so maybe by comparison he just seems swallowed by the rest of them. Nice find! Glad he was able to speak on it for a moment. That's not a terrible sketch either, the proportions are pretty spot on. It's almost sadly haunting in a way. I genuinely don't know what incentivised Billy Zane to do Valley of the Wolves Iraq because that movie has irrevocably damaged his career. It's painful to see that he was never asked to return, his Ansem performance was so memorable! We can only truly speculate. Both him and Gary Busey worked on that movie, and they still have had busy careers as actors. It wasn't really as detrimental as the KH community makes it out to be. I saw this post in Tumblr a few days ago and it's equal part heartwarming as it is sad. Imagining Billy Zane not being fond of the role as Ansem somehow made his absence in KH more bearable to me, so this is downright tragic. I personally wouldn't have minded him not returning to KH2 since Ansem's voice was only used in flashbacks and when Riku was in Ansem's form, which sort of helped the story in implying that it wasn't really the actual Ansem, but man I would have given anything for Billy Zane to voice him in Reverse/Rebirth at the very least. It doesn't even surprise me anymore when hearing an actor getting replaced with not even first being offered to reprise the role. Still pisses me off when it happens, though. But...while do think it was wrong to not even give him the chance to come back, I much prefer Richard Epcar, and while I can't place it, a part of me feels his acting would have suffered harder from the later voice direction than Richard Epcar did. Personally, I'm glad they replaced Zane because I found his performance forgettable. But I wish he wasn't replaced like this. Hard to believe we could've had his great voice acting to do the heavy-lifting of Ansem SOD's repetitive, bland dialogue over the years, but instead had Epcar foisted on the character. No offense to Epcar, but he was never able to fill that role. Zane's thing was and is always a shame, but I've just had a great lift off my chest. I remember vaguely hearing something about him being blacklisted, and without delving into it I just thought he was kept away because of some offensive statement or reprehensible conduct (I think it was right around when these news about actors were multiplying). I'm at least glad to know that even if the rumor is correct, he didn't do anything atrocious. Hard to believe we could've had his great voice acting to do the heavy-lifting of Ansem SOD's repetitive, bland dialogue over the years. I do wonder what would it have been like if Zane was the one saying "Darkness within Darkness awaits you." Probably 100% less campy and lame. His darkness speech in KH1 before the final boss was pretty full of Narm if just reading the words itself, but Billy Zane managed to pull it off to sound grandiose and significant. The only drawback to retaining Zane as Ansem would have been witnessing the steady diminution of his character into a Team Rocket style crony and having him strain to make that believable. With Epcar blunting the impact, I don't really feel any attachment; it's almost fitting to have the performance lessened accordingly. Really cool that Zane remembered and did care somewhat about the role! It really sounded like he had fun. I love Richard Epcarâ€™s making the role his own, though. I also always thought that Clancy Brown wouldâ€™ve been great to replace Zane. His light, delicate Lex Luthor type villain voice sounds quite a bit like Zane, but is unique in its own right. It would have been nice to hear Zane return as Ansem in Re:COM and other future titles-- imagine how hype Terra's transformation into Terranort would have been if the reprised lines had been performed by Billy Zane. My personal theory is the same. I think the casting director for KH2 didn't think Ansem's role was worth paying Zane again, so they found someone new to do the few necessary lines for the character, and that decision stuck for the rest of the franchise. Sure, Zane didn't have tons of lines in KH1, but he played a big pivotal role in the game that was certainly worth paying for the sought talent. 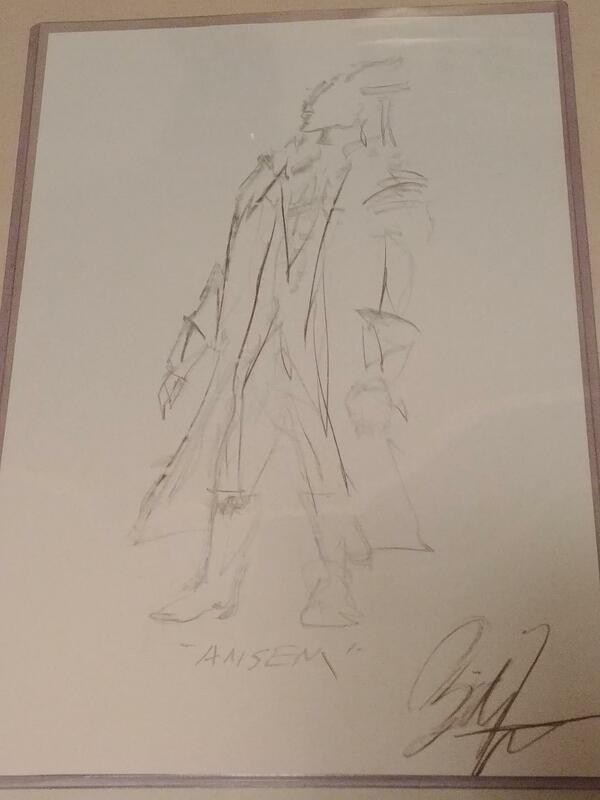 Awww, that's cool that Zane remembered Ansem and drew a sketch of him. It's too bad he never returned but at least he gave us some of the most memorable lines from KH. but nobody remembered him in Back To The Future: Part 2?